^ Cauchy, A. L., Recherche sur les polyèdres - premier mémoire, Journal de l'École polytechnique, 1813,, 9 (Cahier 16): 66–86. ^ L'Huillier, S.-A.-J., Mémoire sur la polyèdrométrie, Annales de Mathématiques, 1812–1813, 3: 169–189. ^ Sylvester, James Joseph. Chemistry and Algebra. Nature. 1878, 17: 284. doi:10.1038/017284a0. Berge, Claude, Théorie des graphes et ses applications, Collection Universitaire de Mathématiques II, Paris: Dunod, 1958 . English edition, Wiley 1961; Methuen & Co, New York 1962; Russian, Moscow 1961; Spanish, Mexico 1962; Roumanian, Bucharest 1969; Chinese, Shanghai 1963; Second printing of the 1962 first English edition, Dover, New York 2001. 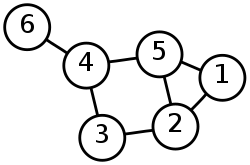 Biggs, N.; Lloyd, E.; Wilson, R., Graph Theory, 1736–1936, Oxford University Press, 1986 . Bondy, J.A. ; Murty, U.S.R., Graph Theory, Springer, 2008, ISBN 978-1-84628-969-9 . Bondy, Riordan, O.M, Mathematical results on scale-free random graphs in "Handbook of Graphs and Networks" (S. Bornholdt and H.G. Schuster (eds)), Wiley VCH, Weinheim, 1st ed., 2003 . Chartrand, Gary, Introductory Graph Theory, Dover, 1985, ISBN 0-486-24775-9 . Gibbons, Alan, Algorithmic Graph Theory, Cambridge University Press, 1985 . Golumbic, Martin, Algorithmic Graph Theory and Perfect Graphs, Academic Press, 1980 . Harary, Frank, Graph Theory, Reading, MA: Addison-Wesley, 1969 . Harary, Frank; Palmer, Edgar M., Graphical Enumeration, New York, NY: Academic Press, 1973 . Mahadev, N.V.R. ; Peled, Uri N., Threshold Graphs and Related Topics, North-Holland, 1995 . Mark Newman, Networks: An Introduction, Oxford University Press, 2010 .